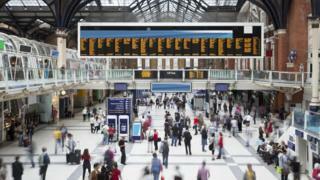 Several rail firms are reporting problems with pre-paid ticket collection from machines across the country. Greater Anglia, Thameslink, Stansted Express, Southern, Southeastern, and ScotRail all confirmed the issue had been affecting passengers on Tuesday. Most rail companies said proof of purchase, such as a ticket reference number, was being accepted instead. Customers are being advised to use staffed ticket offices where possible. One person tweeted that the button to collect pre-paid tickets was greyed out on “every machine” at London Liverpool Street. A spokesman from the Rail Delivery Group, which represents train operators, said the problem was with one supplier of the machines. He said: “We’re sorry for the inconvenience caused and are working with the relevant supplier to fix the problem as soon as possible. He confirmed the issue would be affecting multiple operators but would not affect all machines across the country. Virgin Trains said their ticket machines had not been affected. The issue is only affecting collection of pre-paid tickets, and all other ticket types can be bought from the machines. Is technology becoming less disruptive?